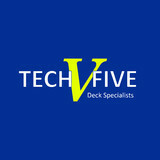 TECH FIVE is your go-to team for custom deck and porch needs in the greater Appleton/ Fox Valley, Green Bay and Oshkosh area. TECH FIVE is committed to your satisfaction during the design & sales process, lead-up, construction and use of your new custom space. We focus on using the best looking low maintenance decking materials available in todays market. Our Owner, Nick, was previously an employee of The AZEK Company training the entire lumber channel on alternative decking, railing and fastening options. Call us today to get the most knowledgeable full service design & build experience available. We develop and specialize in new, innovative systems allowing us to safely build structures on bluffs, hills, water fronts and any erosion affected terrains. Our methods don't affect those fragile and most beautiful areas in contrary, they work in tune with their natural conditions and actually help preserve them. Mark Fabisch has been in the contracting and remodeling business for 25 years, and has been exclusively working with Phantom Screens for the past 7 years. Phantom screens are a beautiful and effective solution for the common drawbacks of relaxing outdoors, such as insects, solar heat gain and lack of privacy. Retractable screens allow you to experience the best of both worlds--uninterrupted views when the screens are retracted, and let in fresh air without worrying about bugs. Wisconsin Screen Solutions is able to provide a wide variety of screens that match any architectural style. 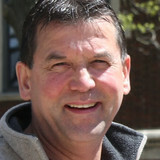 Mark will work closely with you to be sure you get the exact look you desire. Call Wisconsin Screen Solutions today! Foundation solutions for decks, sunrooms, trellis, gazebos, etc. Utilizing Helical Piles. Ready to build on the same day! I have started a family business doing the skill trade I love the most, concrete. I do not take shortcuts or work just for a paycheck. I put my all into every job and pride myself on making each customer 100% happy! Having doing concrete for 8+ years, I have become very skilled and have learned additional concrete work. We are a small family owned company specializing in concrete flatwork. Stamped/decorative, trowel finish, stained, driveways, patios, sidewalks, garage slabs, basements. ALWAYS UP FOR A CHALLENGE AND LEARNING NEW SKILLS THAT WAY COME MY WAY. 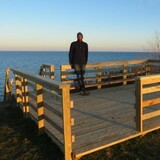 Kirch Improvements, LLC is a custom deck builder and outdoor living space professional based in Brookfield, WI. We have over a decade of industry experience.We pride ourselves on building your deck with high quality products and craftsmanship. Our estimates include everything needed to get the job done; we don’t want you to have any surprises on the final invoice. We handle the permit process, we can meet with your Homeowners Association to provide them drawings or material samples to approve your project, schedule all inspections and try extremely hard to communicate with our customer’s every step of the process. We appreciate that our work area, is still your home. During the build, you can expect our skilled craftsman to sweep up debris from the work areas and stack any unused building materials out of the way before leaving the jobsite each day. All of the products we use are brands we trust to ensure your new deck is solid from the foundation, to the finishing touches. Additionally, we stand behind every deck we build with a workmanship warranty. Building a deck isn’t something you do every day. We want to make your experience with us as hassle free as possible. If you find a part of your deck that isn’t holding up the way it should, we’ll work with our suppliers through the warranty process so you don’t have to. We’re one call away even after your project is complete. Awning Sun is a full service company offering a wide range of products and services to create comfortable, functional and profitable outdoor environments. Our products include infrared heat, motorized louvered roof systems and wind drops and screens. We provide engineered design, custom layouts, complete installation and maintenance services. We are a small locally owned business. The owners, Bernie and Sharon Bos, founded Sun Comfort Inc. in December 2007 with a goal of providing customers with comfortable, attractive, well-constructed sunrooms. We feel it is important that we and our employees take pride in delivering efficient and personalized service. For quality sunrooms at affordable prices, choose the expert renovation pros at Sun Comfort. Serving residents of Southeastern Wisconsin since 1947, we offer the highest quality three-season and four-season sunrooms, patio rooms, and other outdoor living products from only the best manufacturers. All sunrooms are NOT the same! Ask us about The Bear Sunrooms Difference. What services do deck and patio builders in Waldo, WI provide? To help you choose the ideal style, configuration and materials for your deck or patio, your deck and patio contractor will survey your Waldo, WI lot and your home to come up with a design that complements your exterior as well as being structurally sound. He or she will recommend sizes, heights and construction materials that suit your lifestyle and climate, as well as explain the best stain or finish options. Additionally, deck and patio professionals can provide insight into additional components such as outdoor kitchens, patio covers, fire pits, outdoor lighting, arbors and more. Your deck and patio professional might work closely with another Waldo, WI lawn and landscape professional. Here are some related professionals and vendors to complement the work of decks, patios & outdoor enclosures: Landscape Architects & Landscape Designers, Garden & Landscape Supplies, Stone, Pavers & Concrete, Landscape Contractors, Building Supplies. 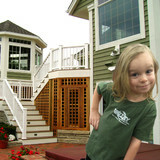 Find a deck and patio builder in Waldo, WI on Houzz.